We finally took our first camping trip the other day. We had been trying all summer but as the norm, things kept coming up. This trip wasn’t smooth either. Within an hour of reserving our campsite my dear husband remembered he had an evening shift he had to work. We packed quickly, he took the boys and the dog, I ran to pick up last minute supplies and we raced out there. Upon my arrival Chad left, leaving me to set camp while watching my little lost boys and pup. Luckily I proved myself more capable than I thought and set up camp, took the boys to the lake, even started a fire and made dinner and it all went fairly stress free! Chad showed up sometime around dusk and took the boys on a walk giving me time to inflate the new mattress. We roasted marshmallows, made s’mores. Willem wasn’t interested in roasting the marshmallows as he saw them as perfect in their original form, that is until he saw his brother doing it at which point I turned to see him roasting his own marshmallow on the end of a pine needle. Sleeping was easy even though it was tight, 4 people in a 3 person backpacking tent, we might be looking to upgrade soon. 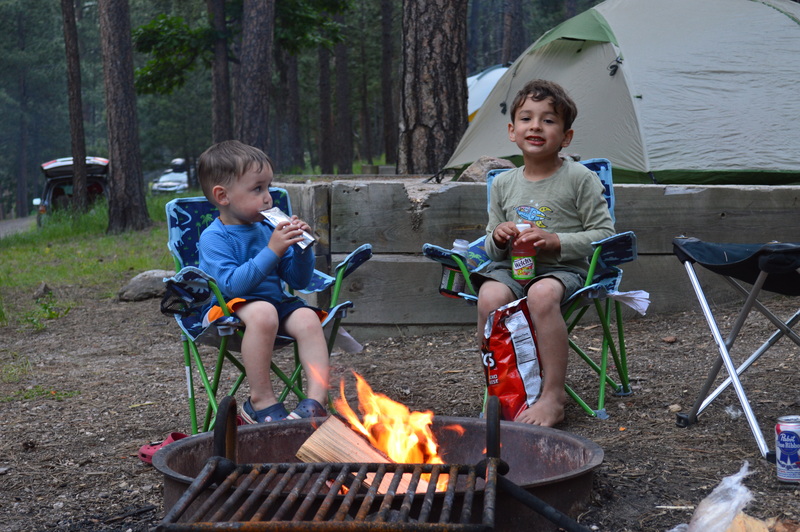 The boys had a blast, all Harper talks about when we drive through the hills is camping. We are blessed that we have kids that love the outdoors as much as we do and equally that we live in such a beautiful place where being in nature is so accessible. Here’s to hoping we squeeze in a couple more trips before fall brings a chill.